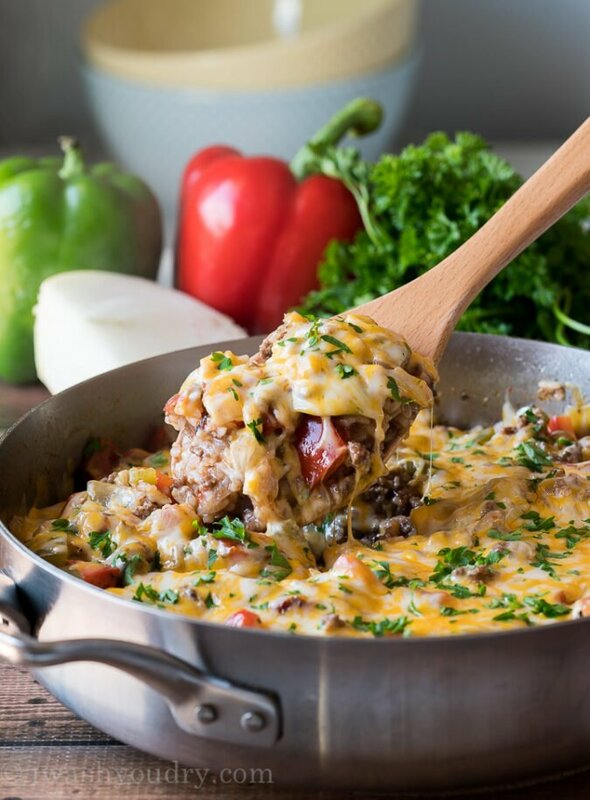 This Ground Beef Stuffed Pepper Skillet is filled with all the flavors of traditional stuffed peppers, but made in just one pan in less than 30 minutes! I figured it was time to share another one skillet dinner with you since it’s back to school season and all. 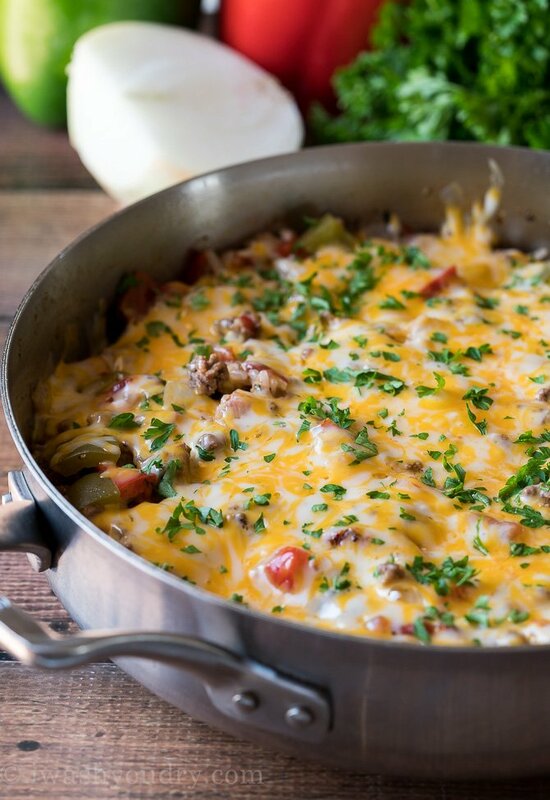 There is nothing better than a quick and easy recipe that only dirties one pan. Less dishes for the win! Start with one pound of hamburger and brown it in a skillet with onion and garlic. Drain the fat then add in some uncooked rice, diced tomatoes, diced bell peppers and plenty of spices. Add in some beef broth then bring the mixture to a boil. I used a fire roasted diced tomatoes for this recipe, which I think brought out some great flavors. If you don’t have those on hand, you can definitely use regular diced tomatoes. Stir in a little tomato paste along with some Italian herbs to give the broth a little more body and depth of flavor. Make sure you bring the skillet to a boil before reducing the heat to a simmer and covering with a lid. If you skip that step it’ll take much longer to cook the rice fully. Add any color of pepper to the skillet that you like or have on hand. My favorites are red and green. Try using ground turkey or chicken in place of the ground beef if desired. Using minute rice with this recipe would require changing the amount of liquid and rice called for. Minute rice needs a 1:1 ratio of rice to liquid, so keep that in mind if you’re changing the rice in this recipe. 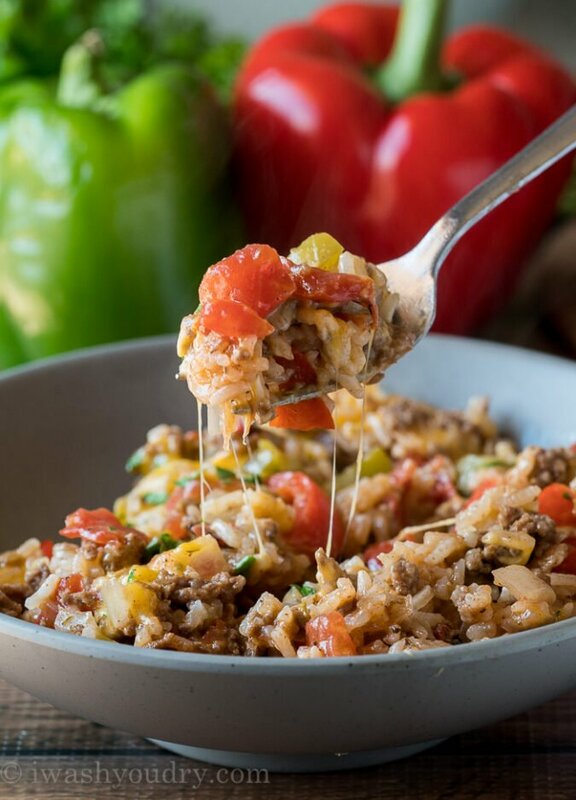 If you love the flavors of stuffed peppers, you’re really going to enjoy this super easy one skillet dinner. My kids demolished it and quickly asked for seconds. 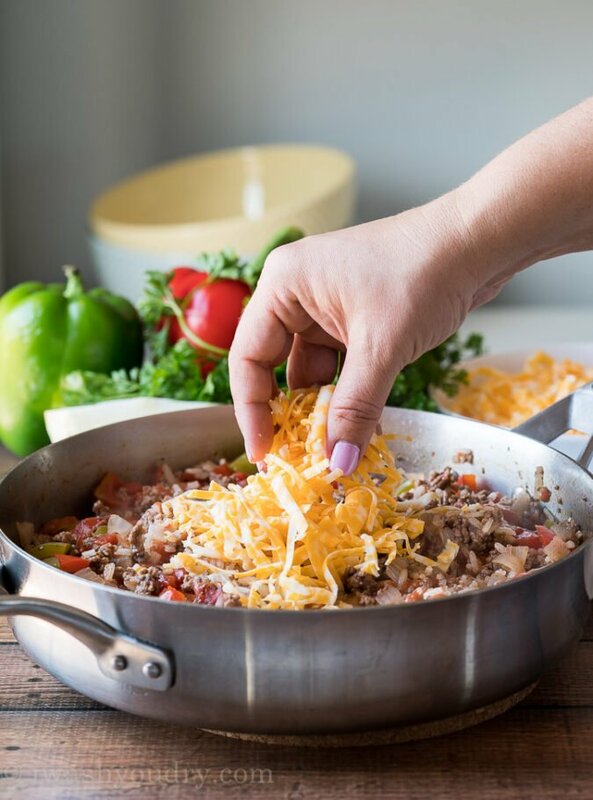 Are you a fan of ground beef recipes like I am? It’s something that I always have in my freezer, pre-portioned and ready to go whenever I need a quick dinner. That’s why I’m loving this recipe. 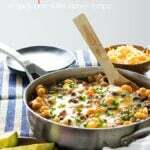 Quick, easy and mega delicious! I’m sure you’re going to love it just as much as we do! 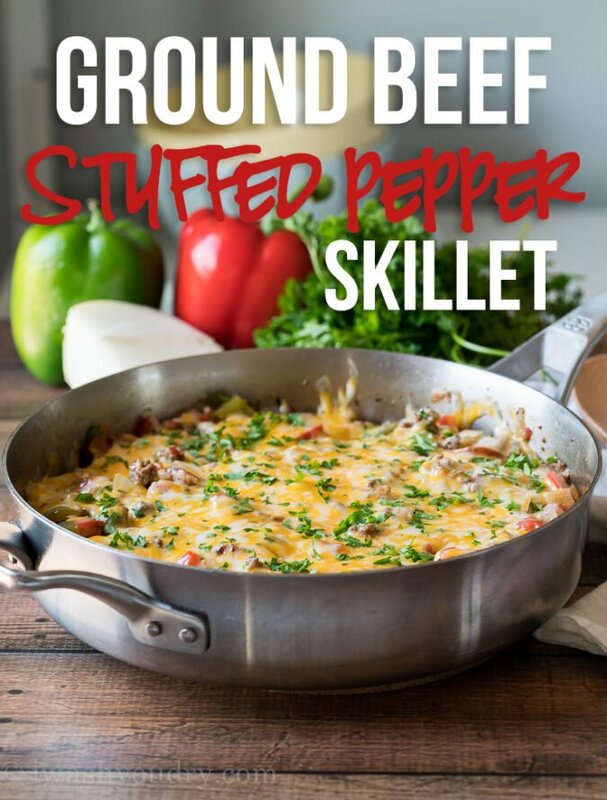 This super easy Ground Beef Stuffed Pepper Skillet is made in just one pan in less than 30 minutes! All the flavors you love of a stuffed pepper without all the hassle! 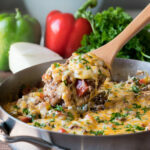 Brown the ground beef with the onion and garlic in a skillet over medium heat until ground beef is fully cooked, crumbled, and no longer pink. Drain and discard any fat. 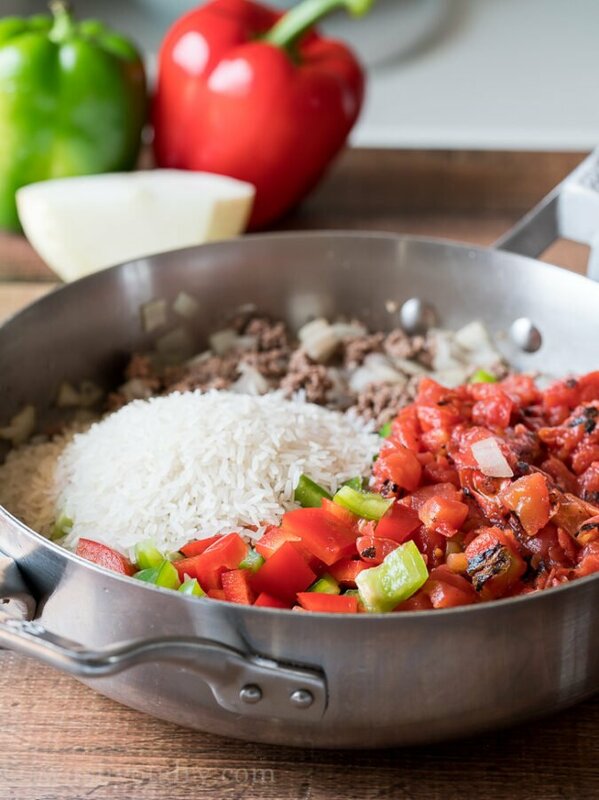 Place the skillet back on the heat and add in the bell peppers, diced tomatoes, rice, beef broth, tomato paste, Italian seasoning, salt and pepper. Stir to combine and bring mixture to a boil. Fluff the rice with a fork and top with the shredded cheese. Cover again and let cheese melt over low heat. Garnish with fresh parsley and enjoy! We are wanting to try substituting the rice with riced cauliflower this next time. 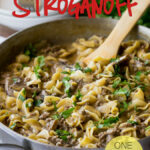 How much of the riced cauliflower and beef broth would I use in substituting, and do I cook the riced cauliflower first? (Birdseye frozen steamer bag) Thank you! You’ll want to use about 2 to 3 cups of the rice cauliflower, and just about 1/2 cup of beef broth. No need to precook the cauliflower, it’ll cook in the skillet. Hope that works out for you! Used fresh tomatoes and cooked onion, peppers, and tomatoes in olive oil seasoned with garlic salt until softened . Browned hamburger separately in about a tablespoon of worstershire sauce. Drained, then combined all in one large skillet with rice and cooked on lower heat to blend flavors. Once done, used to make a Chipolte style burrito topped with melted shred cheese and picante sauce. Yum! Tomorrow I will use another green pepper split and fill it with left over and bake. Browned hamburger separately in about a tablespoon of worstershire sauce. Drained, then combined all in one large skillet with rice and cooked on lower heat to blend flavors. Once done, used to make a Chipolte style burrito topped with melted shred cheese and picante sauce. Yum! Tomorrow I will use another green pepper split and fill it with left over and bake. This is so good love it & easy to fix. We absolutely love this and devour it! We are wanting to try substituting the rice with riced cauliflower this next time. 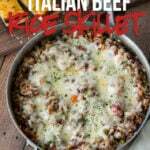 How much of the riced cauliflower and beef broth would I use in substituting, and do I cook the riced cauliflower first? (Birdseye frozen steamer bag) Thank you! Sounds amazing! Any thoughts on switching out the brown rice for quinoa? This was delicious! Made it exactly as directed and can’t out perfectly and was so easy! Recipes are easy and so delicious. Made something similar. Used fresh tomatoes and cooked onion, peppers, and tomatoes in olive oil seasoned with garlic salt until softened . Browned hamburger separately in about a tablespoon of worstershire sauce. Drained, then combined all in one large skillet with rice and cooked on lower heat to blend flavors. Once done, used to make a Chipolte style burrito topped with melted shred cheese and picante sauce. Yum! Tomorrow I will use another green pepper split and fill it with left over and bake. That sounds amazing care to share the recipe please?